One of the functions of thought is to be occupied all the time with something. Most of us want to have our minds continually occupied so that we are prevented from seeing ourselves as we actually are. We are afraid to be empty. We are afraid to look at our fears. As you well know there is a time for everything within Creation - a time to let go, a time to integrate, a time to rest, and a time to heal. At this time of our ascension journey, we welcome the Equinox, on September 23, whose energies have been very present since the beginning of the month, with a powerful, and healing, Full Moon at 2 degrees of Aries. This new light influx is being of great assistance for those who are ready to embrace more Light and release more layers of their egoic self, confronting their fears and embracing the clarity that will help them come back to their true soul path. If during the first weeks of September we had a time to rest and soothe ourselves, in the last one, we are going to begin, again, a new integration phase. It is all depending on where you are in your journey, for even though we generalize, we all have our micro cycles and these are the first ones we must honor and take into account above any other outer events and/or frequencies. 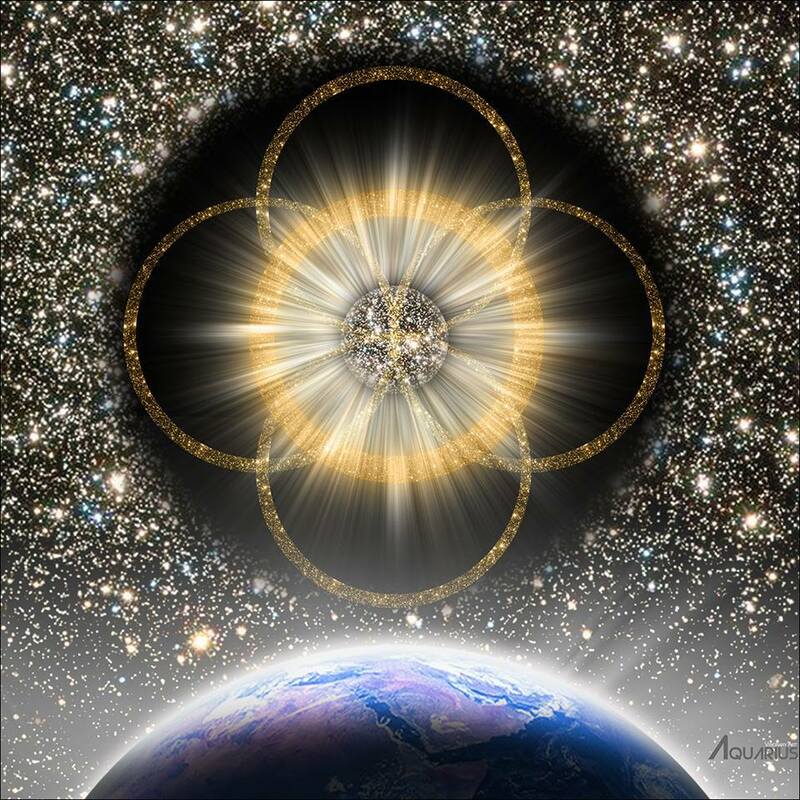 For those who have already done of their existence a path of conscious devotion to service, these cosmic events will benefit them to open new galactic venues to help anchor these new frequencies on Earth as well as within ourselves. This passage, especially during the Equinox, will be also a great one for us to receive the stellar transmissions coming from other galactic civilizations as well as non-physical beings. The last phase of this month is also going to be a very important one for those who are devoted to work with the planetary stargates. For it is a time to open gateways, anchor their codes, and stabilize them. Although as you know, we all help, in our unique way. There are many whose main role is to help by their mere Presence, and hence Essence. Please honor that, it is enough. This is equally sacred and in the moment you try to be more or do something that is not your soul task, what you do is to diminish your power - allowing dark forces to use you as a vehicle for their dark purposes. However, in the moment you recognize who you are, and honor your unique Spark, you become more empowered and offer what you are meant to share within this dense plane. The Equinox, whose energies have been deeply felt, at least in my personal experience, since the end of August, is going to be very intense this Year, bringing into the surface everything that is not healed/unified within our physical bodies, for it is the only way in which we can become aware of that which is still holding a lower frequency. Every physical pain that has no medical diagnose, as I always say, for this is very important, is telling you that there is a part or aspect of yourself that is still in pain, whether you are conscious of it or not, and then as the Light enters, it presents resistance, for it fights it, impeding it to fully flow through your entire body, healing and dissolving all the barriers our human self has built. Every single sensation whether physical or inner one shows us where we choose to ignore our bodies, due to our human fears, or simply because we tend to run, forgetting to pay attention to what our body shows us, simply because we are too busy with human distractions. This is why it is so important that we take some time, daily, to focus on our bodies and feel every part of them, for each one of them tells us a unique story that deserves to be heard. The Equinox together with the Full Moon show us if we are ready to embrace more Light and devote ourselves to integrate and share it, or if we are yet in need of a physical cleansing/healing. In any case, all is perfect for where we are, for in truth there is not a better or perfect path, as all will, in the end, lead us to unite with the Loving Source from where we originated from. During the Full Moon in Aries we have a Cardinal T-square, as the Moon, the Sun and Mercury in Libra, square Saturn in Capricorn. This is precisely the aspect of this Moon that invites us to be real, to be who we truly are, to stand tall in our truth and to honor our feelings. While Mercury square Saturn is the catalyst that bring into the surface our fears, negativity and everything that we shall dissolve, at this time. It is indeed a wonderful opportunity to work on self-power and initiations, for it is with Aries that we begin to initiate ourselves, once again, within this eternal Divine Spiral, experiencing the power of Fire and the strength, energy and passion it brings, if used wisely. It is with this sign that we begin to learn how to live without fear - trusting in a Higher Intelligence that orchestrates everything, in a perfect way, for All. It may seem this Full Moon in Aries brings complications, especially for those who resonates more with traditional astrology, for it square Saturn, the Planet of Responsibility. However, like I said before, when there is an obstacle there is, at the same time a solution for us to dissolve the issue, and in this Moon the solution is given by the Moon in conjunction with Chiron, the Cosmic Healer, as I call it, making of this Moon an opportunity for us to bring balance, as the Equinox's energies also invite us to do, and harmony. This is a gift for us to work with the benevolent lunar forces and begin to use its light to bring feminine healing, work with our emotional wounds, as well as to dissolve the 3D distortions that were caused to us, and our bodies, by the negative agenda. As the Moon also opposes Mercury, it will be also a challenge, and again another opportunity, for those who suffers from delusional thinking to work on their human illusions, bringing clarity, from within, before continuing to feed their distorted version of reality. It is pivotal that we work on having a healthy mind, for if not, our delusions, as well as fake guidance, will control our lives, making real what is just a mind construction. On the contrary, the Moon sextile Mars, is a blessing, for it gives us the courage, power and enthusiasm to deal with all the challenges and wounds that can surface, at this time, in our bodies or within ourselves. The most important thing of all when we are under a personal crisis, or experiencing what we call the dark night of the soul, is never to blame or judge ourselves, or try to get rid of our pain in "miraculous" ways, trusting only in the outer or in others for remedies, but to work on self-love, confidence and power not to fall into egoic traps as feeling unworthy, allowing the mind to be infected by our pain. Using our pain, instead of denying it, to construct a strong personality is essential in this path when we pass through whatever challenges our soul, in its wisdom, puts to us. As you know, the Moon is an artificial satellite. Due to the depth of our Moon history I will not enter into it. However it is important to remark that the Moon has never been a natural stellar body, so to say of our solar system, and that it was used, or manipulated, by the dark forces. for eons, to serve their destructive purposes. However, this does not mean that the original nature or essence of the Moon, was or is of "negative" nature. The Moon was connected, artificially, to our Planet and hence as such it has a profound impact in our Waters and also in our emotionally body, as you well know. The Moon's influence has always been, and is still, very potent within our earthly realm. And it is our choice to use its essence to heal or to allow our human illusions and programmed fake beliefs about the Moon, made to glamour our human minds, to impede us see the truth about its essence. I understand, as it happened to me for a while, in my evolutionary journey, that many will not believe it, for we have been deeply manipulated to believe in a perfect and bright Moon that controls us and that could help us to awake our intuitive channels, and manifest a perfect reality for us. However, once we are fully awake and begin to use only our personal guidance system, to navigate through our reality, we begin to discover the misinformation that is being spread. This is why it is so important, when we are in an advance stage of our ascension journey, not to read, keep searching outside and believing all we hear, for we can, fall again, into fake programing. Another important fact is the human abuse that the Moon has had by humans. The Moon, according to my own guidance, was submitted to nuclear experiments, making it impossible for humans to visit it until a time passes, which is why they show no interest in visiting it, again. That the surface of the Moon has been deeply manipulated is nothing new. However, its essence, still remains pure, for those who are ready to see beyond the mistreatment it has had. The Moon's light can be used to heal the many manipulations that we have suffered due to the fake transmissions sent through it for eons. If we truly desire to align with the real nature of the Moon, is important that we disengage from the typical associations that we were taught about the Moon that are not real and begin to use its essence to work on feminine empowerment by liberating ourselves of the many chains that were implanted through the Moon to us and by dissolving many of the 3D emotional wounds that were also implanted to us. Glandular implants. As you know, one of the many purposes of the Moon was to distort our higher senses or channels so we could not have the natural access that we always had, as Divine Beings, to our God Self, and hence, to Source. This is one of the main causes of why some people have their pineal gland calcified or "closed" as well as one of the main reasons that impedes our Kundalini rising. Feminine imbalances, and in women especially, to avoid the restoration of our feminine power, something which affected to our sexual organs as well. Sixth and seventh chakras issues. Blood pressure and other imbalances. For the Moon affects directly to our blood circulation etc. The Moon's essence is a magnificent one to work on personal manifestations. Remember that not everything is acting and manifest. For manifestations are always understood as being something tangible, when it can simply be something non-physical as for example creating a more peaceful state of being, without relating it to any material things or people. However, we also came here to experience a human realm, and to descend our soul desires, and dreams, into this dense plane, mastering our inner magician and making tangible what we can only envision, in the non-physical,is pivotal. I understand that many of you are already thinking about manifesting with the power of the Moon only during certain phases. For those who are asking themselves about the veracity of the Moon phases, it is very real. For even though, the Moon is always Full it is also real that when the Sun only illuminates one side of the Moon, we do not receive so many light as when the Moon receives the sunlight in its entirely. The more Moonlight receive, the more our Planet is affected. When we work on manifestation with the essence of the Moon, for it is always available, whether we see it entirely or not, we can work on the manifestations of the things that we think we need for our human experience. What I personally do is to write a list of at least seven things, although to be honest every time I do it I desire less and I can only write three things as much, but this is obviously your choice. Visualization and conscious intention is important, for we are going to be meditating and visualizing what we desire, from our soul, for at least seven days or the number of your desires. The use of special crystal grids with certain stones you feel guided would be also beneficial, as well as going into nature and any other tools you consider important for you. Visualize yourself already having it, and already thankful for having it, for you know it will sustain, or nurture your human self, as well as soul, in the physical, and begin to only ask for that which is aligned with your soul, for otherwise will not serve the self, and will not be supported by your God Self and Universe, as we all obtain what is going to be for our highest good and that of All, and this is something that many times, we are not quite ready to realize, for we think something will be good for us while our soul clearly knows it will not benefit us at all. As you well know, our Sol is very active, especially since our Planet finally bifurcated from old earth. The Sun light does not only affects our Planet but also everything within our Galaxy, as it is the Moon. It is thanks to the Sun essence that the Moon is beginning to transmute its dark, manipulated, side, and giving us, at the same time, the opportunity to do so as well. If you set the pure intention and send it to your Unified Self that you wish to work with the healing power of the Moon's original essence, you could benefit from a huge fountain of healing energy, especially at this time with the Moon conjunct with Chiron. It is important that you embrace the inner shadows that the Moon shows you, for there is nothing to fear, simply to understand and let it go. We are never governed by outer forces. We are free sovereign beings, who were deeply manipulated, but who are now beginning to awake, discovering the powerful beings that we, in nature, truly are. We are not here to allow other forces to control us but to work and co-create with them, for within this loving universe there is nothing that is ever meant to govern others, but to help, protect and love All, unconditionally. The Divine Waves received during the Equinox pasage, are not just a source of healing for us humans but also for our Planet, for the Light we are receiving belongs to a Higher Intelligence that loves All, as equal. Our Planet is also experiencing a deep opening in the stargates that connect with the Universal ones, and it is the mission of some ascending souls, and the reason why some are being relocated, to help into the process of bringing back its crystalline essence and original connection to Earth. There are many planetary stargates healers who are being moved to other places or simply staying where they used to be, against their human will, due to their soul commands. When we begin to awake from a long unconscious state of being, it is usual that many of us feel as if we were not where we are meant to. However, this comes from a place of lack of understanding and communion with our soul, for in the moment we hold the pure intention to be of service, we no longer are aligned with our human desires, not because they are not good, but because our human will or desires, have become One with our soul one. It is vital that the ones who are being relocated or simply staying in a place where they are not totally comfortable, understand that there is, always, a higher purpose for where they are, apart from the fact that the starseed souls or sovereign beings descending from certain non-physical dimensions, already possess certain codes that are meant to be in perfect resonance with where we live, for this is where we are meant to heal or be of assistance. The Earth stargates that connect with the galactic universal stargates are beginning to be fully open, as it used to be, eons ago. It is our purpose to consciously work with them, uniting our forces, to help them being reconnected, again. At this time, I have received there are many souls who are required in certain places where some of these stargates are located, for they need more support and they are meant to function as healing pillars. This is also for those that feel guided to work with the reconnection of these stargates, whether physically, astrally or simply by ending their purest intention to help. Thank you for all you are and for for All, Beloveds. For every single kind gesture, and intention, help more than we can imagine. Easter Island, Chile - there are many groups who go there with the mission of dissolving dark frequencies there, for this Island's history is also very profound, and there were also dark purposes there. As always, there will be more places where more souls are needed to bring back the lost crystalline essence of these gates. It is important that devotion to service, whether we serve the Planet, the elementals, animals or guide other humans, become a part not just of our mission, but of who we are. When we finally aligned with our God Self, we no longer make any separation between our mission and who we are. We do not even see it as a work or something we have or must do, but something that is natural for us, which makes us be in our natural state of joy. This is a very powerful healing Full Moon, a cosmic event who is amplified by the Equinox and even more with the waves coming from our Central Sun, which as you know is very active. This is a time for us to stand tall in who we are and reclaim our sovereignty. For even though our human self may still miss the remnants of the old, many of us are already dwelling within a new dimensional space, where fears, doubts and old wounds are transcended and transmuted into freedom, power and unconditional love. We no longer need of what used to enslave us. We no longer need to give our power to outer sources, feeling hopeless and as mere puppets moved by others. For now we recognize our Divinity, dwell in it and know that above all, we are all equally powerful, loved and appreciated. Hiding behind our fears served us to feel safe, when we live in separation. At present, we no longer need to cover our power, for we have chosen to dwell in possibility, honoring and embracing the magnificence of who we are, as the Divine LoveLight beings, in service to All, that we have chosen to be. I wish you with all my heart a magical, and blessed, passage, Beloved Companions! May you, always, remain in the Illumined Essence of your God Self, where pure unconditional love and clarity resides and no human fear can touch you. May we unite, as One, to assist our Beloved Planet in its transition from a state of unconsciousness to a free sovereign Planet.